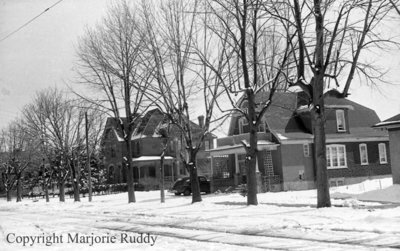 A black and white negative of two unidentified houses in winter. View is from the street. Large trees line the sidewalk. We do not know the location of the house. The negative was found in a cigar box with no documentation. Unidentified Houses, c.1945, Marjorie Ruddy. Whitby Archives A2013_040_836B.